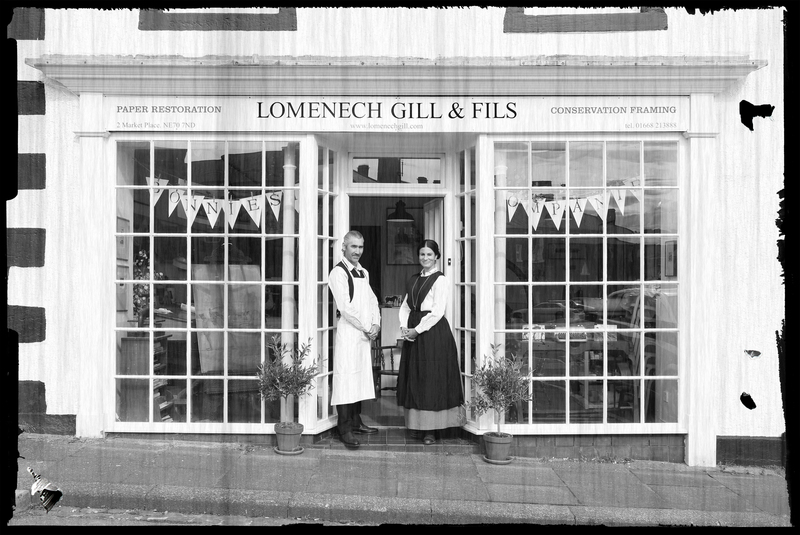 WELCOME TO THE WEBSITE OF LOMENECH GILL & FILS! We are a small artisan workshop and studio, situated in the small coaching town of Belford, just off the A1 between Alnwick and Berwick in north Northumberland in a premises which was opened in the 1800’s as John Laing’s Grocers and Provision Merchants. It is now the home of fine artist and printmaker Olivia Lomenech Gill, and Lomenech.eu, who offer the combined services of expert paper restoration, bespoke, conservation framing, and professional exhibition installation, all under one roof. Our normal working hours are 9 – 4, Monday – Friday, but the varied nature of our work means that sometimes we are working away, so it is always worth contacting us in advance if you would like to make an appointment. We are a working studio rather than a shop but you are welcome to visit, find out more about what we do, and we always have a range of artworks on display as well as a selection of artists books for sale. We also hold events once or twice a year, so if you would like to be put on the mailing list just send us an email. We look forward to seeing you. A bientot!